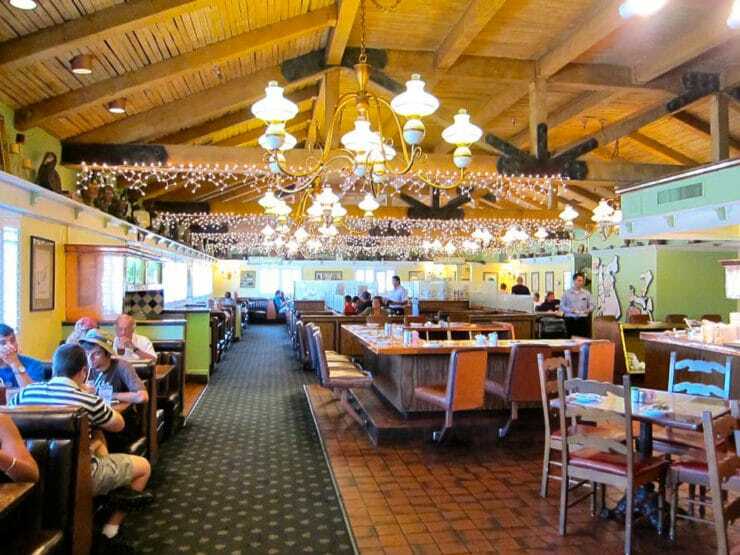 Growing up, every once in a while, my dad would come up a brilliant idea: “Let’s go to Pea Soup Andersen’s for lunch!” The restaurant was a 1.5 hour drive from my hometown. It was, admittedly, a long way to go for a bowl of soup… but I never questioned it. In fact, I looked forward to it. We’d pile into his truck and cruise through the California countryside to Buellton. 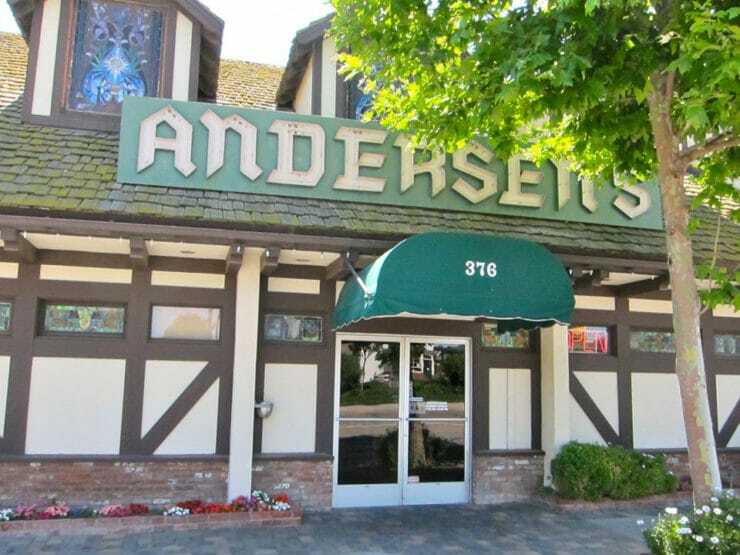 Along the way, Dad loved to recount the story of when he first visited Andersen’s. I don’t know why that story amused my dad so much, but it did, and I always enjoyed hearing him tell it. Those weekend jaunts to Buellton are one of my favorite childhood memories. And the soup… oh, the soup! On a recent summer road trip with my hubby, we left Los Angeles and drove up the 101 freeway towards the Central Coast. I knew we’d be passing through Buellton, so I insisted we stop in for a bowl of soup. Along the freeway, for miles in each direction, billboards beckoned us to the restaurant. The Andersen’s cartoon mascots, Hap-Pea and Pea-Wee, held up signs to let us know how many miles we had left… 112 miles! 35 miles! 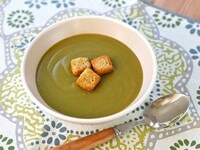 The countdown built anticipation as I imagined that creamy, comforting bowl of pea soup. Before we knew it, we were there. Pea Soup Andersen’s first opened their doors on June 12, 1924. The small cafe was run by Danish immigrant Anton Andersen and his wife, French immigrant Juliette. Anton had been a maître d’hôtel and catering manager, first in New York, then Los Angeles. His brother ran a business in the Danish town of Solvang, just a few miles from Buellton, so Anton and Juliette visited the area frequently. Over time, the couple grew tired of city life. When the 101 freeway was diverted through Buellton and electricity first came to the area, Anton and Juliette decided to buy a parcel of land. They moved to Buellton with their young son Robert T. and open a cafe. It was originally called “Andersen’s Electrical Cafe,” named after the family’s coveted electric stove– the only one in the Santa Ynez valley at that time. “Andersen’s Electrical Cafe” started as a roadside diner, catering to weary highway travelers. Anton acted as a short order cook, while Juliette became known for her finer French-inspired specialties. The couple tried out a variety of dishes in the beginning, adopting the ones that customers liked best–sandwiches, pancakes, ice cream. The little cafe became well known in the area, and customers began to visit from nearby Santa Barbara. Reporters from the Hearst newspaper empire would pass through on their way to and from Los Angeles and San Francisco. Celebrities stopped by on their trips up and down the coast. Before long, the cafe had made its mark on the local landscape. About three months after opening, Anton and Juliette introduced pea soup to the menu. It was an immediate success, leading them to make the soup a permanent fixture. At that time the cafe was tiny, and Anton didn’t have a place to store the large sacks of dried peas needed for the increasing soup demand. He solved this by placing the gunnysacks in the window, along with a sign that read: “The Original Home of Split Pea Soup.” It started with an initial order of 10 pounds of peas… then 100. Within three years of opening, the Andersen’s had placed an order for one ton of split peas from Chicago. That’s a lot of peas! In 1928, the Andersen’s expanded their business, building a hotel and adjacent dining room. They renamed the place the “Bueltmore,” combining the name of the Biltmore hotel (where Anton once worked) and Buellton. 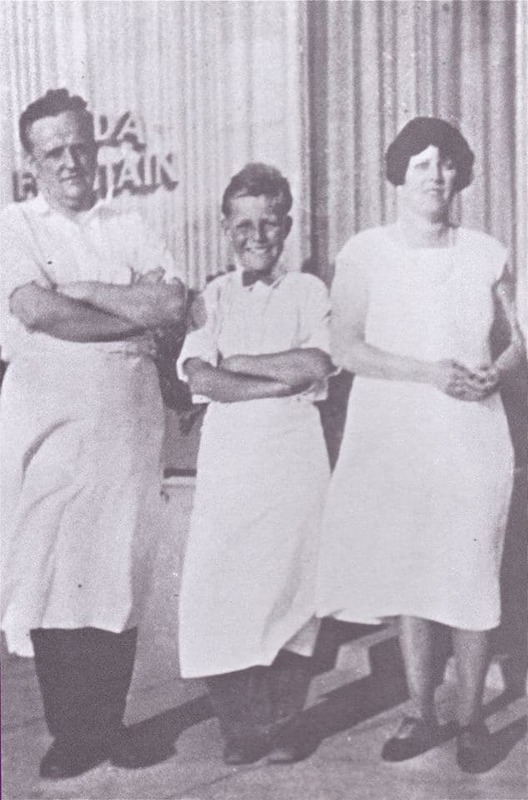 In the late 1930’s, Anton and Juliette’s son Robert joined the family business. Known by the nickname “Pea-Soup,” Robert was responsible for many of the marketing plans that helped bring the restaurant even greater success– billboards along the highway, family-friendly menus, and announcing to the public that they sold over 100,000 bowls of soup per year. The hotel was again renamed– Andersen’s Valley Inn. Robert’s wife, Rosemary, opened a gift shop in the restaurant. The business continued to grow. 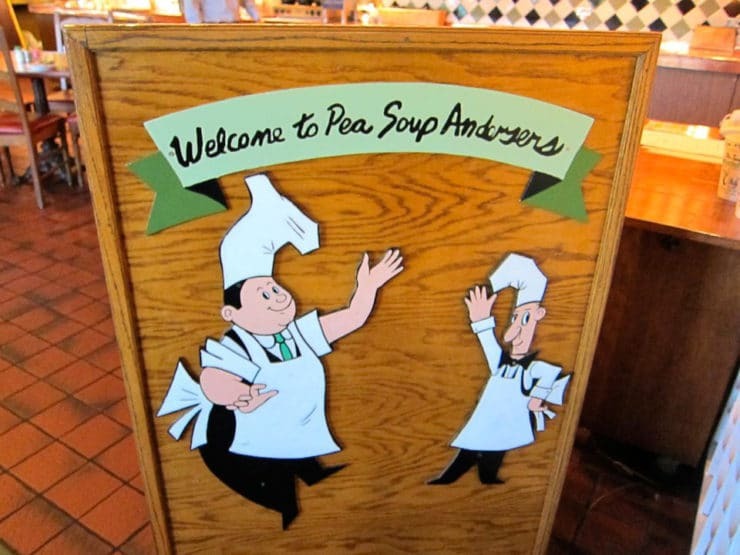 Over the years, Pea Soup Andersen’s continued to expand. A Danish bakery and cocktail lounge were added. New restaurants were opened in Santa Maria and Salinas. The family business was eventually sold to Vince Evans, a local actor and ranch owner who was good friends with Ronald Reagan. Under Vince’s ownership, the business flourished, eventually purchasing 50 tons of split peas a year to keep up with demand. The Santa Maria and Salinas locations were sold, and another location was added in Santa Nella, CA. Vince ran the business successfully for 15 years. In 1980, sadly, he and his family died in a small plane crash near Santa Ynez airport. The business was eventually purchased by Pea Soup Properties Limited in 1983; that corporation continues to run the business today. 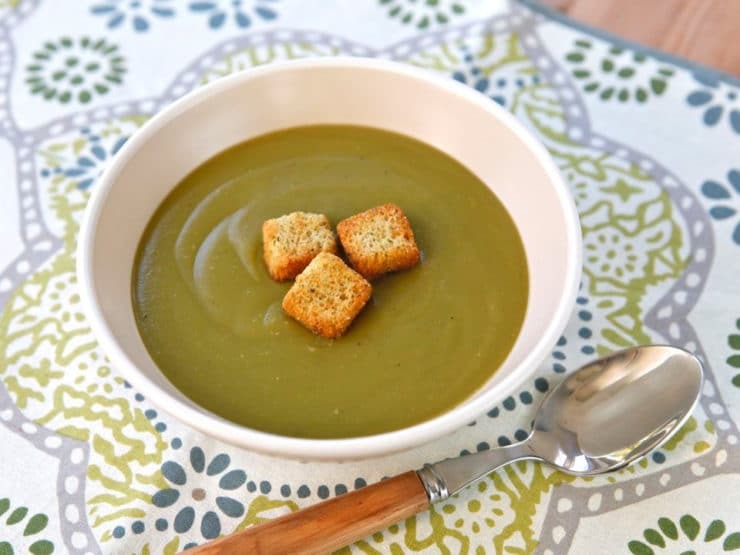 The company now sells over 1.5 million bowls of pea soup per year; they also sell canned pea soup to grocery stores across the country. What I love most about Andersen’s is how quaint and kitschy it is. It remains unchanged from my childhood– the same carpet, pea-green walls and orange seats that I remember sitting in as a ten year-old. It’s oddly cozy, with a Danish theme throughout. Bringing my husband there for lunch was a trip down memory lane. I ordered the Traveler’s Special, like I always do… a bottomless bowl of soup, pumpernickel bread, onion bread, and a chocolate milkshake. The bread just okay (not as good as I remember it). The milkshake was so thick and creamy, I had to eat it with a spoon. And the soup… oh, the soup! You can get it with ham added, if you want. I’ve always opted for the meat-free version. It has plenty of flavor on its own. After we’d had our fill of soup, we headed out through the gift shop. 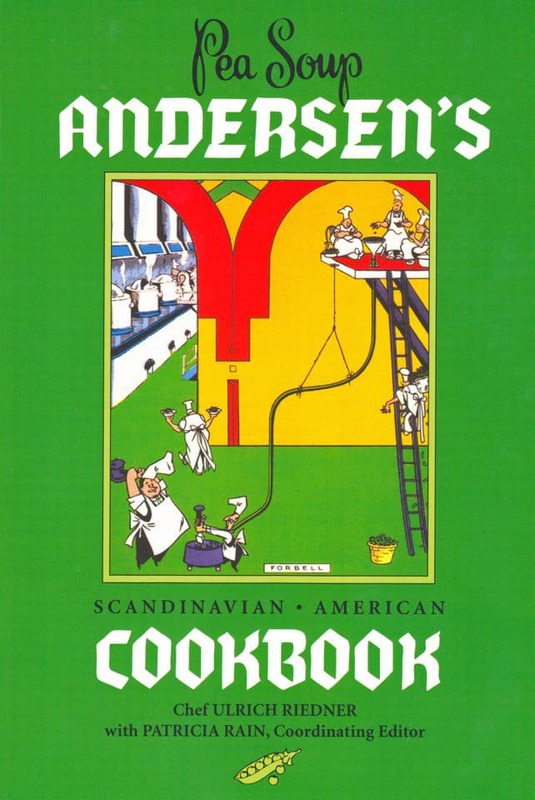 I picked up a copy of the Pea Soup Andersen’s cookbook, a thin volume of restaurant-inspired classics and authentic Scandanavian recipes. Of course, I was most interested in the famous Pea Soup Recipe. There are other fun vintage dishes in there, too, including Danish Meatballs, Herring in Sour Cream, and Stuffed Onions. Even though the recipe in the cookbook says it’s the “official” pea soup recipe, I felt it wasn’t quite right, so I adapted it slightly. After a bit of tweaking, it’s just like the soup I grew up loving. You’ll want to use a food mill to acheive the proper texture (I use this one at home and recommend it highly). Don’t be put off by the green pureed appearance. If you’ve never tried Andersen’s soup before, you’re in for a treat! I topped mine with a few chunky seasoned breadcrumbs, they sopped up the soup nicely. Obviously you should omit the breadcrumbs if you’re gluten free or watching your carbs. 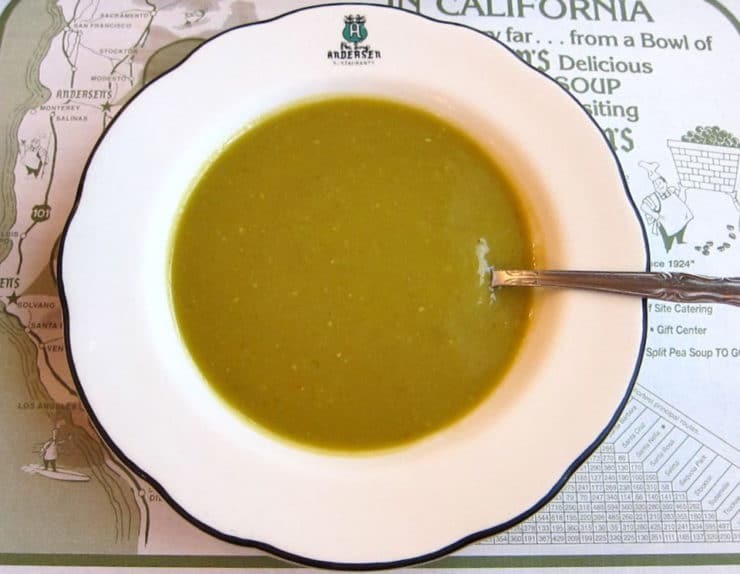 Vintage recipe for Andersen's Split Pea Soup from Andersen's Restaurant in Buellton, California. Family recipe. Vegan, Gluten Free. Combine the peas, celery, carrot, onion, thyme, bay leaf and cayenne in a soup pot and cover with 2 quarts (8 cups) of water. Bring the pot to a boil. Keep at a high simmer for 20 minutes. Reduce heat to a low simmer. Let the mixture cook for another 25-30 minutes till the peas are completely tender. Towards the end of cooking, add the seasoned salt, then add salt and pepper to taste. I use about 1/2 tsp salt and 1/4 tsp of pepper. Use less if you're sodium-sensitive. 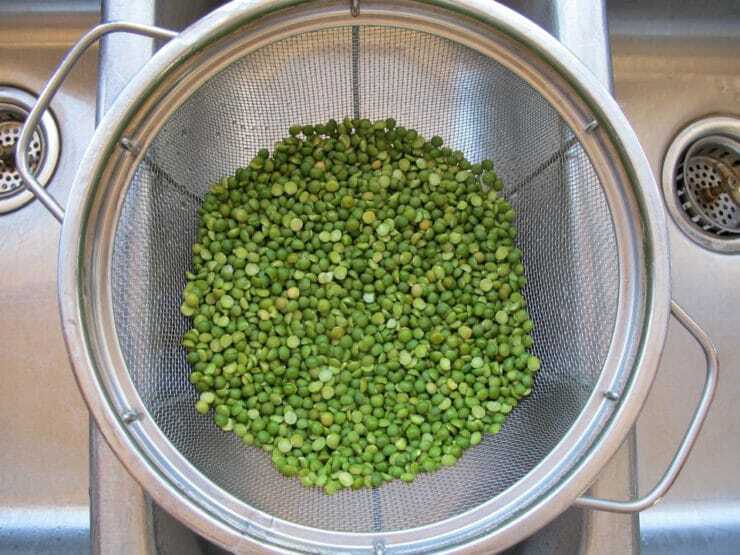 Process the pea mixture through a food mill or a fine mesh sieve. A food mill will create the smoothest, creamiest texture. 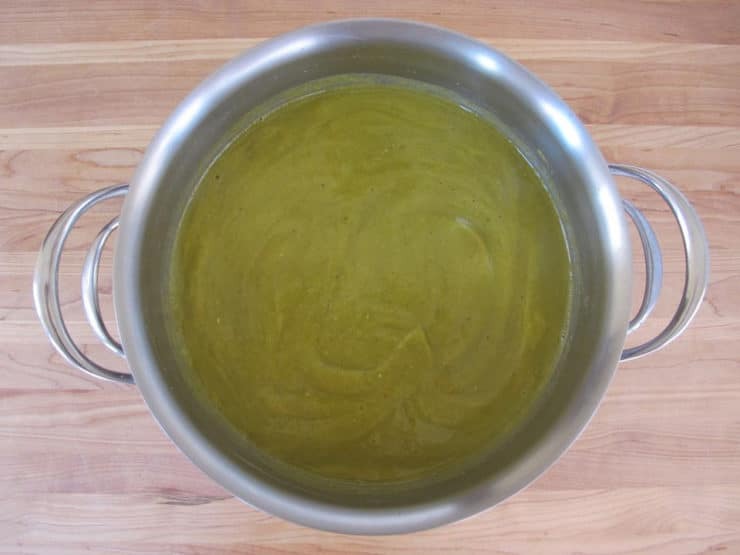 Process the pea mixture until all of the liquid is pushed through, and only pulp remains. A creamy soup will result. 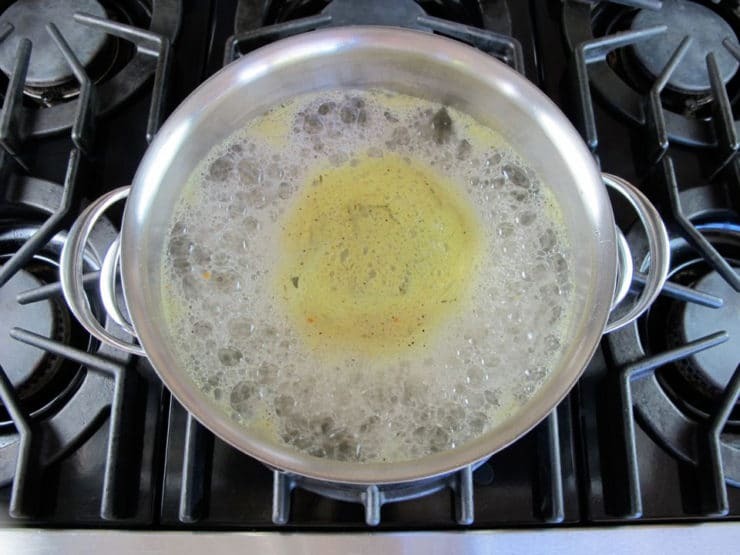 Bring the soup to a quick boil once more on the stovetop, then remove from heat immediately. 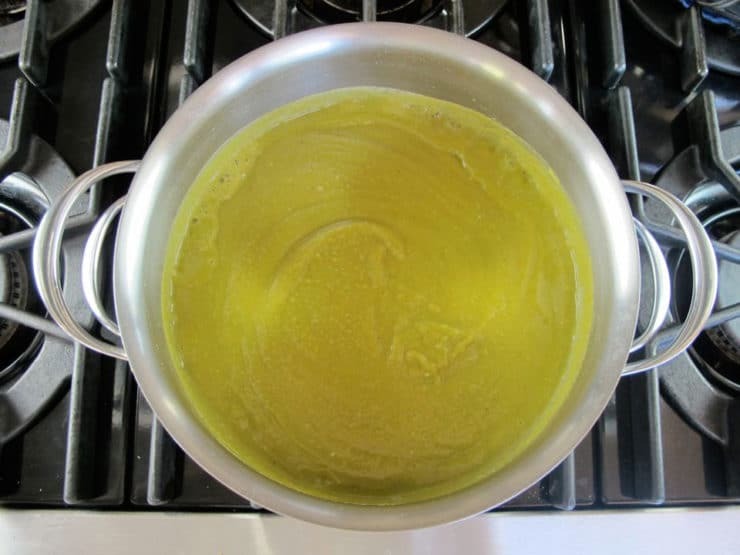 If the soup seems too thick, add some hot water to thin it out to the desired consistency. Serve hot. I like to garnish the soup with a few breadcrumbs. Omit them to keep the soup gluten free and vegan. Keep leftover soup in a sealed tupperware. When the soup is chilled, it will solidify. 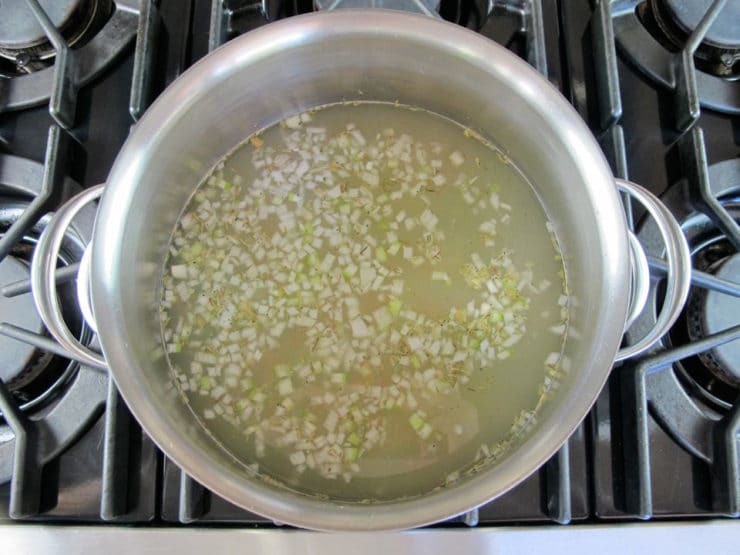 Adding a little water and stirring as you reheat will help the soup to heat up more smoothly. 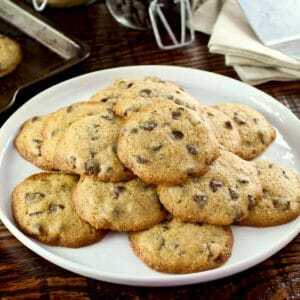 Thanks for posting the history and the recipe! I’m a Californian too and love Anderson’s. This recipe is ridiculously easy, I didn’t have celery or carrots, but I did have leeks. The leeks worked beautifully and the porkless pea soup was slurped up by all! Thank you for the Memory! Bob Pea Soup Andersen taught a few classes at Santa Barbara City College in the mid 70’s. There is a Hotel Restaurant Management Program there. I graduated with an A.S. In 78. I actually stayed an extra semester to take one of his classes. I didn’t realize that Andersen’s published a cook book! Would love to get one! I live in North Carolina now but grew up shuttling between Arizona and Southern California, and remember Andersen’s split pea soup well. I have spent my life comparing all pea soups to that and none measured up. I am so anxious to try this! One question, do you use the fine disc or the medium disc on the food mill? I want the silkiest texture I can get! Fine disk will make it more silky. I was laughing reading the story because we used to do the same thing. I grew up in Camarillo,Ca. We used to go up on a Saturday to eat soup and bread then walk around Solvang. Those are some of my best memories as a kid. That soup was the best and I didn’t even eat peas. LoL! Thanks for posting the recipe. I need to make it. Is it OK to add ham shank? 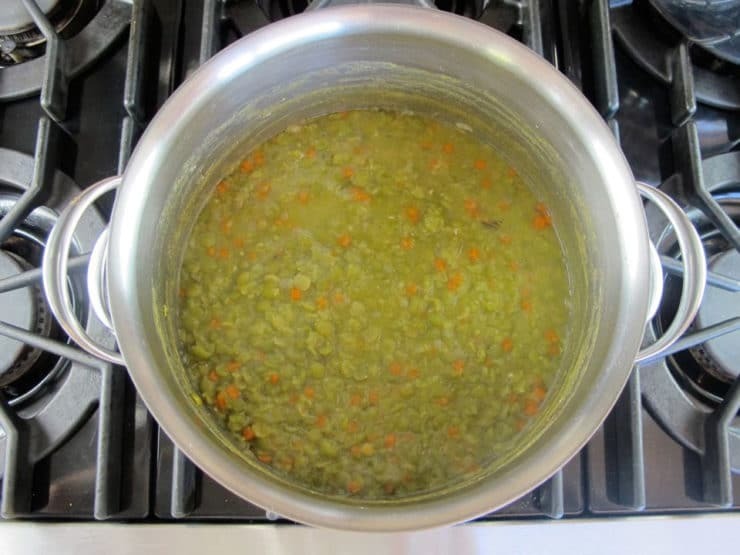 Just tried this recipe tonight, as I too am a former Ca resident who grew up on Anderson’s split pea soup and was thrilled to find this recipe! I am by no means a chef, but I carefully followed the directions and it turned out perfectly. My beans were older so I think it took me an added 30 mins to get them “fork tender” and then I used an immersion blender to puree it. I also added some fresh ham from Thanksgiving and even my very cooking wise mother in law was impressed. 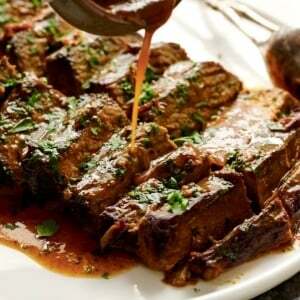 Thank you so much fot this recipe, it will now be an added staple for dinners! Thank you for publishing this recipe. I bought the split peas from Andersen’s one year and made the recipe that was attached to the package of split peas. Somehow I lost that recipe so was glad to find this one. I make this often because it is high in protein. The only modification I make for this recipe is that I make it in my pressure cooker. I reduce the water to 6 cups because the water doesn’t evaporate out. Turns out great! I use an immersion blender too. Last time I was there I bought their seasoning that goes really well with the soup. And thank you for adding the nutrition facts. So many of these sites don’t add that useful information. Just made this today. Really great. Used immersion blender, hate to waste the fiber using food mill. Added left over cooked cabbage and potatoes. A dash of sunflower oil for richness and smoothness. I plan to make all winter. Watch the sodium, and I don’t think it is anything but a super healthy meal. Bottomless bowl anyone? 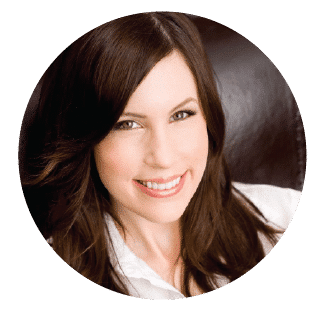 what brand food mill are you using? Thanks for a great recipe. I use chicken stock instead of water and it tastes great. My in laws always stop at Anderson’s and being from Ohio, I had no idea what Anderson split pea soup was. It is fantastic and one of my all time favorite soups. I know the chicken stock takes away a bit from the authentic Anderson split pea soup, but it adds to it in my opinion. Thank you again for such a wonderful recipe as we have been making this recipe for a couple of years now. Thank you for the great write-up. I was looking for the recipe, but enjoyed the text even more, as your memories are exactly the same as mine! Except it was my Mom and I going there. 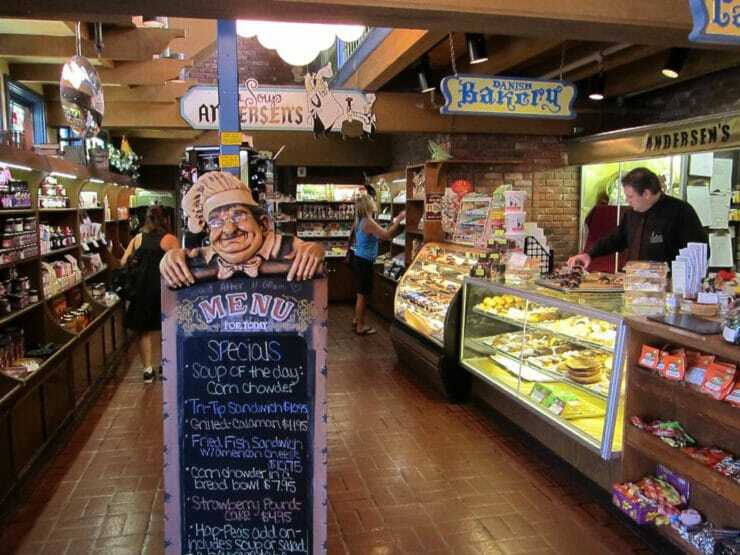 Have always loved Pea Soup Andersen’s and Solvang. By any chance does your cookbook include a recipe for a Danish dish of chilled cauliflower with a yellow-ish sauce covering it? It was always served at the Mollekroen restaurant in downtown Solvang on their smorgasbord in the cold salad section. The restaurant was upstairs across from the post office. I haven’t been able to travel there for quite some time but have learned they are now closed. That cauliflower is one of my all-time favorite dishes and I haven’t been able to find the recipe for it. It was served whole-head. Thanks for any help you may be able to provide. I’m going to make the soup this afternoon! 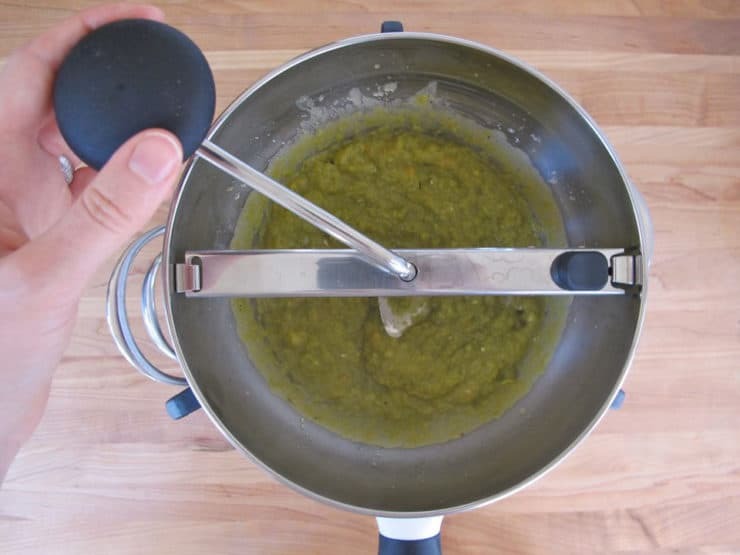 I’ve made split pea soup using my immersion blender and it works well for those who don’t have a food mill (I don’t have one), although you don’t get quite the same creaminess. But it’s good enough for me! I purchased ham bones from the Honey Baked Ham store and will add that in too. Can’t wait for a yummy dinner! i don’t understand this at all — i followed recipe perfectly. after the stated cook times, my peas were still as hard as pebbles. i have now been cooking it for over 3 hours straight, and peas don’t even seem halfway tender. none of them have broken down at all. Hi Rebecca– that doesn’t make sense, peas shouldn’t take more than an hour to soften. Is it possible the peas you have are very old? Sometimes older dried legumes can have trouble softening. Amazing, thank you for sharing this! Now I don’t have to drive to Anderson’s. Lol! I can’t wait to try this! 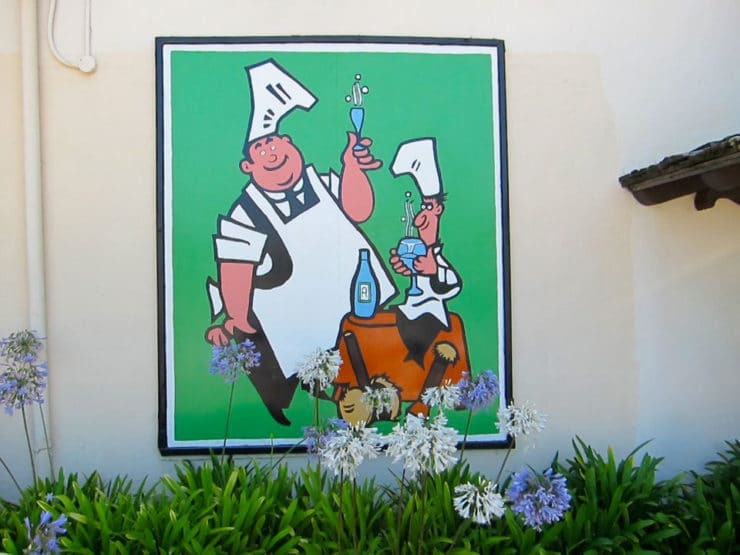 We love the restaurant in Buellton and it has great memories for our family. There have been some canned versions, but we have been searching for “the right” recipe. Thanks! Usually when I hear “strain” I think to discard the water. You were not clear if you discard the water or keep it. I discarded the water and then tried to cook the drier peas and they burnt. But if I had blended them first in a blender I wonder if that would have worked. So I re-added water and then blended them. I’M SO CONFUSED. Please clarify if the straining step includes discarding the water or keeping it. BTW, I was using a colander as my strainer. I don’t have a food mill. Hi Jonathan- ok, a few things. First, when the peas are done cooking, there really shouldn’t be any water left… it should be more like a thick soft mixture with no separation between peas and liquid. 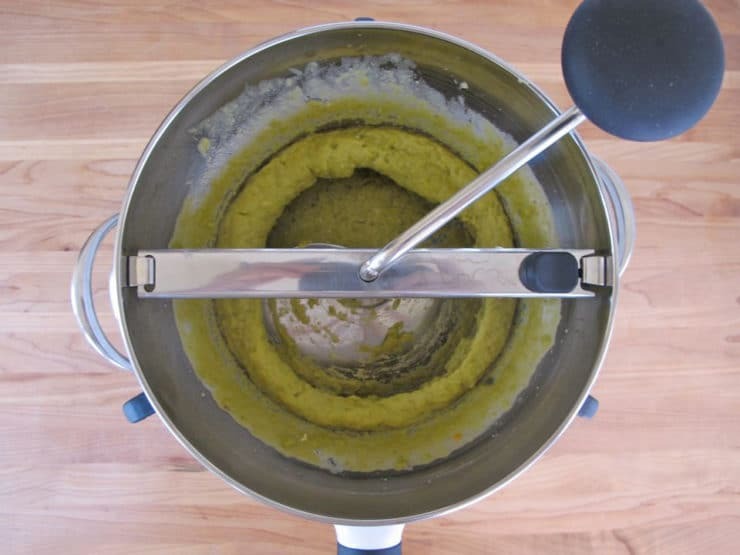 I changed the word straining to processing in the recipe to make it clearer, but as the recipe states you really need to push all of the mixture through the food mill– and if you have cooked it long enough, it would be very difficult to remove the water from the peas. Also, a colander won’t work here– a food mill will give you the proper texture, but if you don’t have one you can use an immersion blender to achieve a thicker soup that is still smooth. I hope that clarifies things. All of the liquid and the ingredients cook together to create this soup. I adore both Anderson’s locations. They are my favorite stopping points on the way to and from visiting my son at college. There soup is amazing and works well for me as a vegan, while my family can add ham to thirst. I was wondering if the cookbook you have a picture of has any other recipes in it and if so for what? I love stopping at this restaurant when I come to California the soup is really good. great place to stop and the coleslaw is the best. What do yo do with the pulp? I have many memories much like yours of going to Anderson’s for the soup. I have made this a number of times and have shared the soup with a friend from Sweden. He loves it and says it tastes like home. Thank you fo the recipe. I just finished making this recipe for the first time and I had to jump right on here to echo the words of many other commenters: this recipe is delicious and tastes just like the original! My dad has always been a big fan of the soup and I was happy I could recreate it for him. Thank you! 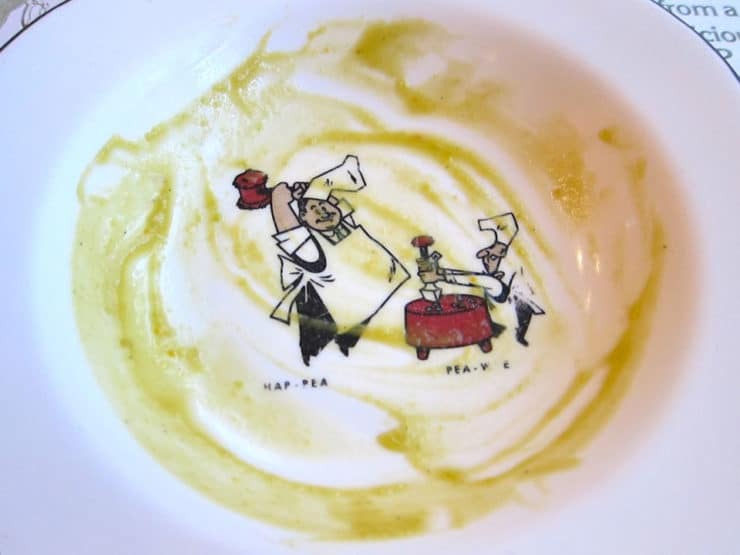 In the early 90s, I stopped at a Pea Soup Andersen’s on a road trip from LA to San Fran — I was a vegan at the time & my omnivore friend raved about how good the soup was even without meat (a big surprise to her). For some reason we didn’t eat there, but I did pick up a copy of the recipe and have made this soup many, many times over the years; all those who say it is appreciated by those who love pea soup, converts those who think they hate it, with or without ham (I’m still a vegetarian, but my wife usually wants to add some kind of smoked meat). At some point I lost the recipe card so I was happy to find your version, which matches my memories of how this soup should taste in all its beautiful simplicity. Thank you so much for making it available here! For the record, I have never put it through a food mill, but I find that as it sits in the fridge, the peas break down enough to achieve a smooth if not silky consistency. what if I just run it through my food processor when finished instead of a food mill. I don’t have one. Lisa, you can do that but it will be a much thicker soup and won’t have the silky texture that Andersen’s is known for. The flavor will be great though!